Description: Located on the exclusive development of El Pinar de San Gines, this three bedroom apartment is well equipped & has a large private rooftop solarium with stunning sea and mountain views. A generous sized table and 6 chairs means that Al Fresco dining on the solarium is a pleasure not to be missed! The solarium is an ideal spot to watch the vivid sunsets with a glass of local wine. 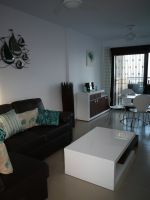 The accommodation in this second Storey unit comprises: living area which has been tastefully furnished in a contemporary design, with leather sofas , dining table with 4 chairs, a DVD player, and satellite TV installed. UK TV and Wi-Fi are available at the property. A second balcony off the lounge allows some shade, with a table and chair set provided to relax and escape from the heat of the sun. The kitchen has a large fridge freezer, washing machine and dishwasher. All bedrooms have large built in wardrobes with plenty of storage. The main bedroom is en-suite with a double bed, the other bedrooms have twin beds. There is a cot and highchair for the use of guests. There are 2 communal pools a few yards away. The area is ideal for families, romantic breaks, walking, nature, diving or cycling holidays. The beach is just 500 metres. Costa Calida: The Costa Calida, Spain's 'warm coast' is a fairly undiscovered part of south-eastern Spain. La Azohia is a totally unspoilt idyllic Spanish fishing village. There are no large tour operators here, and even in the height of the season you will be able to find empty beaches along the coast. The region of Murcia is locally known at the 'Market Garden of Spain' as it grows all kinds of salad vegetables, citrus fruits, nuts, rice and grapes. The Costa Calida boasts 320 days of sunshine a year, average temperatures in the winter are 17 degrees, and 27 degrees in the summer. The governing bodies, the Town Halls, in this region are anxious to protect the national heritage of their mountains, salt lakes, beaches and grasslands and have allocated huge areas to be reserved as National and Regional Parks making this destination a nature lovers Paradise. Longer terms stays welcome out of season, sorry pets not permitted in this unit. This listing has been viewed 3996 times.